Production of the Audi A1, shown here as a concept, starts in Brussels later this year. 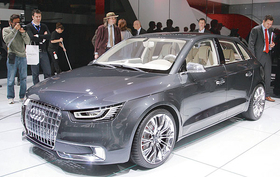 HERNDON, Virginia, USA -- Audi of America President Johan de Nysschen says the US and its small-equals-cheap mentality isnt ready for entry premium models such as the Audi A1, which goes on sale in Europe next year. De Nysschen said that Audi is seriously looking at bringing the A1 here in the cars next generation in six to eight years. Bringing it here earlier could damage efforts to build widespread recognition for the Audi brand, he said. 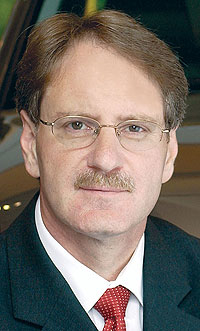 "Not enough people know us yet," said Johan de Nysschen, Audi of America president. De Nysschen said Audis US dealers asked for the A1, until they found out what it would cost. In Europe, the car likely will have a sticker price of about 20,000, that is about $25,735 at current exchange rates.